The risk of a blood clot after surgery is higher and lasts longer than previously thought, say researchers at the University of Oxford. 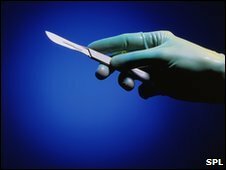 Data from almost a million women found surgery increased the risk 70 times in the six weeks after an operation. Clots are most likely with hip, knee and cancer surgery, they reported in the British Medical Journal. Surgeons said guidelines on giving preventive treatment should be updated in light of the findings. It is already known that surgery, especially joint surgery, increases the chance of a blood clot developing, but the scale of the risk and how long it lasted for has not been clear. The study of UK women followed for six years found that one in 140 will be admitted to hospital with a blood clot during the 12 weeks after any inpatient surgery, one in 45 after hip or knee replacement surgery, and one in 85 after surgery for cancer. This compares with only one in 6,200 women during a 12-week period without surgery. Day surgery was associated with a one in 815 risk - 10 times the risk of not having surgery. Dr Jane Green, co-author and clinical epidemiologist, said the results would apply to men as well. "We know quite a lot about the fact blood clots are much more common after surgery but the thing that's new here is the time scale and we now have reliable estimates of that risk. "And it's a reminder that it is not just the high-risk operations." She added that many more minor blood clots not requiring hospital treatment would not have been picked up by the study. Alexander Cohen, honorary consultant vascular surgeon at King's College Hospital London, said the current guidelines did not go far enough and recommended stockings rather than anti-clotting drugs, for which he said there was no evidence. He added doctors were confused about what they should be doing. "This tells us that people are at risk for much longer. "The research community need to investigate this and the guidelines need to be rewritten." John Black, president of the Royal College of Surgeons said effective preventive treatment had been available since the 1970s. "This timely new study shows the risk period lasts longer than previously appreciated and makes the case even stronger for assessing all hospital patients for risk and treating them appropriately. "The Department of Health, the House of Commons All-Party Thrombosis Group and the Academy of Medical Royal Colleges among many other groups, are working hard to bring the prevention of venous thrombosis to the top of the clinical agenda for every hospital in the UK." Dr Trevor Baglin, chairman of the British Committee for Standards in Haematology, said hospitals were not doing enough to prevent blood clots. "There is a long way to go in the prevention of hospital acquired thrombosis and until it is given the same priority as hospital acquired infection and dealt with accordingly I think it is going to be a long and tortuous route to universal implementation of risk assessment and appropriate prophylaxis."